Color-Your-Own Greeting Cards offers a practical twist on the ever-popular colouring book. These 30 ready-to-colour cards have images and hand-lettered messages for celebrations big and small throughout the year — including birthdays, weddings, anniversaries, welcoming a new baby, and offering congratulations and thanks — as well as more general all-purpose pictures. The heavy-duty back cover offers a sturdy coloring surface for the pre-scored pull-out cards. Accompanying ready-to-colour envelopes mean the completed 5x7 cards will be ready for mailing. The colouring craze remains strong among adults seeking a creative outlet. 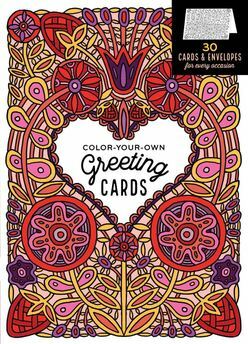 Color-Your-Own Greeting Cards adds a practical element to this hot trend, with 45 ready-to-colour cards for special occasions and everyday celebrations - including birthdays, congratulations, weddings, new babies, and more.